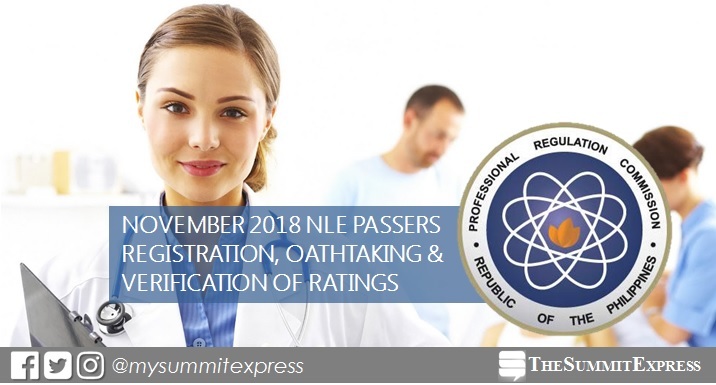 MANILA, Philippines – The Professional Regulation Commission (PRC) officially released on Friday, December 7, the results of November 17 and 18, 2018 nursing board exam or nurse licensure examination (NLE). Congratulations to all passers of November 2018 nurse licensure examinations! As announced, 4,811 out of 12,033 passed the exams. Check out full NLE results on this page or here. Nursing board exam passers next tasks are to register, take oath and exercise nursing profession. Information regarding registration, oathtaking schedule, requirements and venue and verification of ratings (VOR) are all available here as we update this site with details from reliable sources. From December 19, 2018 to January 11, 2019, registration for the issuance of Professional Identification Card (ID) and Certificate of Registration will be done on-line. Please go to online.prc.gov.ph and follow instructions for initial registration. The Oathtaking ceremony for the passers of November 2018 Licensure Examination for Nurses will be held in the following rooms of the Philippine International Convention Center (PICC), 3rd Floor, Delegation Building, PICC, Pasay City from January 8 to 23, 2019, at 10:00 A.M. and 1:00 P.M. for the morning and afternoon sessions, respectively. Through Verification of Ratings on PRC website (https://online.prc.gov.ph/Verification), NLE takers (passers and those who failed the exam) will be able to check grades by entering the required information. These include application number and birthdate. VOR for November 2018 NLE is available in just few days after the release of results.